same league as those superstars. It had more in common with Space Cabby, Brother Power the Geek, The War that Time Forgot and other truly oddball series DC Comics has put out over the years. 18-year-old Prez Rickard, so-called because the day he was born, his mom said he'd someday be president, gained fame by fixing the clocks in his home town of Steadfast, so they all kept the same time. This caught the attention of the incredibly corrupt Boss Smiley, who had been looking for a malleable young man to back in politics, ever since the legal age for voting, running for Congress, and being president was lowered to 18. Boss enlisted the aid of his cousin, advertising genius Misery Marko, who had earlier put Boss's face all over everything in the world (by the way, Boss looked just like that little, round, yellow toon that's been grossing out sweetness haters for decades, Smiley Face); and by the time the first issue (September, 1973) was done, Prez had fulfilled his mother's prophecy. Don't laugh. People have been elected president on flimsier credentials. By that time, Prez had seen through Boss Smiley, and instead picked up with a hyper-environmentalist Native American named Eagle Free, who wound up running the FBI for him. In a lesser whack-fest, Boss Smiley would have become his arch-enemy, but this one had too many bizarrenesses to get through, to bother using the same one twice. Eagle Free maintained his FBI office in a tepee in a lightly wooded area on the Potomac, within easy walking distance of the White House, where he was attended by monkeys, wolves, bears, even a gorilla and an elephant, but didn't have a telephone. Prez oversaw an international chess match, with superhero-like American and Russian players firing electronic rays at each other over an enormous board where living men served as pieces. When an enemy wanted to get a message to Prez, he had it delivered by a dwarf shot through a White House window inside an artillery shell. After opening diplomatic relations with a country bordering on Transylvania, Prez was stalked through the White House by a legless vampire on wheels. In no other comic book would you be likely to see "You're a real Indian fighter, Mr. President!" in dialog. Prez was the brainchild of Joe Simon, who, in collaboration with Jack Kirby, was responsible for a vast array of comics, from Captain America to Young Romance; and without Kirby had recently spearheaded an adventure comics revival at Harvey Comics that also sported its share of outrageous concepts. Simon edited and wrote Prez, with the artwork done by Jerry Grandenetti (Dr. Drew, Haunted Tank and a host of miscellaneous DC war stories). Together, Simon and Grandenetti were responsible for The Green Team and The Outsiders (no relation). Apparently, the world wasn't ready for a comic book series based on the same premise as American International's 1968 film, Wild in the Streets, because Prez lasted only four issues, the last dated March, 1974. 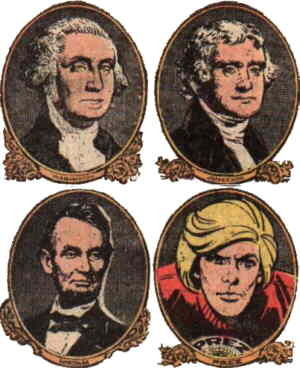 He made one other contemporary appearance, a crossover with Supergirl in her October, 1974 issue, where, for that one issue at least, a teenage president was accepted as simply part of the backdrop of the DC Universe. That was the last of him for the next couple of decades. Prez made another guest appearance in Sandman #54 (October, 1993). Two years later, he was the focus of a special from the DC imprint the Sandman title helped launch, Vertigo, where, characteristically, he was treated a good deal less whimsically. But he still isn't able to sustain a series, and future appearances, if any, seem unlikely to be frequent.